Length: 4 - 5mm. Background colour: black. Pattern colour: red spots. Number of spots: 2. Spot fusions: none. Melanic (black) forms: not applicable. Pronotum: black. Leg colour: black. Other features: distinct rim around the edge of the elytra. 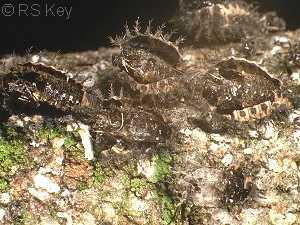 Fourth-instar larva: dark greyish-brown with distinctive long black bristles emerging from each tubercle; bristles bear extensive side-branches. Pupa: uniformly black and shiny; larval skin encloses the lower part of the pupa. Habitats: This species is commonly found in deciduous woodland. However, kidney-spot ladybirds have also been recorded from mixed woodlands, grasslands and scrub in the vicinity of deciduous trees. 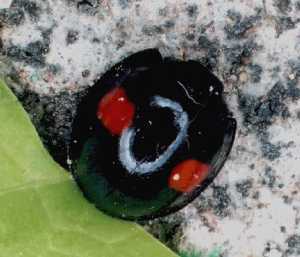 Host plants: Most kidney-spot ladybird records are from the trunks of ash and sallow trees. The species has also been recorded on a number of other deciduous trees including willow, oak, field maple, alder and birch, and also on Leyland cypress. Kidney-spot ladybirds are not uncommon on apple trees and on herbaceous vegetation such as thistles and nettle. 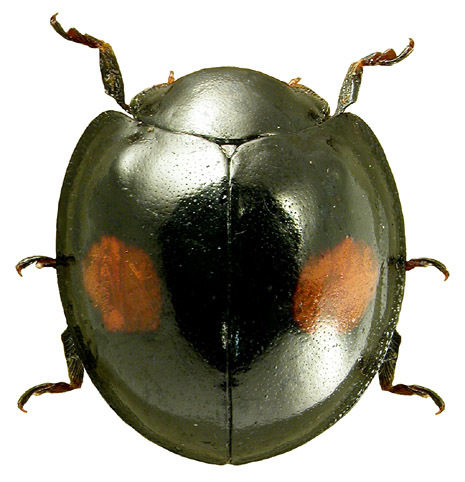 Overwintering sites: Kidney-spot ladybirds overwinter in sheltered positions on deciduous trees, usually near the base.